William “Kid” Dark was an outstanding player who ranked among the very best shooters and passers in the early years of professional basketball. His playing skills were notable, but Dark was also greatly admired for the intangibles he brought to the game. He was a dynamic leader who brought a ferocious competitive spirit to every team on which he played. Dark was raised in Worcester, Massachusetts, but moved to Philadelphia as a teenager. 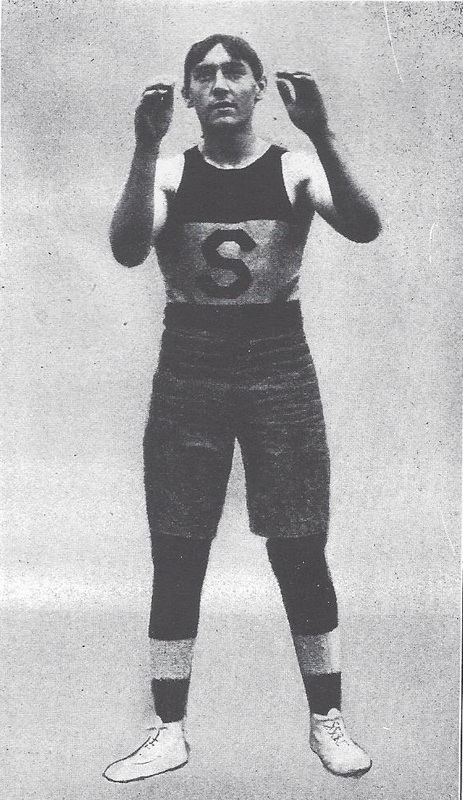 In 1904, the 18 year old Dark debuted in professional basketball with Philadelphia League St.Simeon Saints. In his second pro season, he led the PBL in scoring. In 1906, Dark jumped to the new Central League where he enjoyed his most productive years. He spent four seasons in Greensburg and played for two years in Connellsville. When the Central League folded, Dark signed with Gloversville in the New York State Basketball League for the 1912-13 season. In addition to a change in team, the move marked a change in Dark as a player. Over the years he had gained some weight and had lost some of his speed and agility which hindered his effectiveness as a scorer. In later years of his career, Dark played much of the time as a guard. His ability to play both positions made him a valuable player in an era when most teams carried only one or two reserves. In 1913-14, Dark joined De Neri’s Eastern League squad where he remained for the next three and half seasons. Dark continued to play pro basketball into the early 1920s barnstorming with team throughout western Pennsylvania. William Joseph Dark Born: Aug 4 , 1886 Died: Hometown: Philadelphia, Pa.